What is Mu Sool Won? Embodied in the logo are the mission and principles that Mu Sool Won embraces. The logo was designed with the notion that martial arts practice would be a key element to staying healthy and fit, consisting of the boxed phrase “Mu Sool Won” in Korean, a lotus flower symbolizing a peaceful and ‘clean’ world, a Taeguk symbol representing the harmony of the two ki (life force) energies of um and yang, and a martial artist performing a beautiful high side-kick. 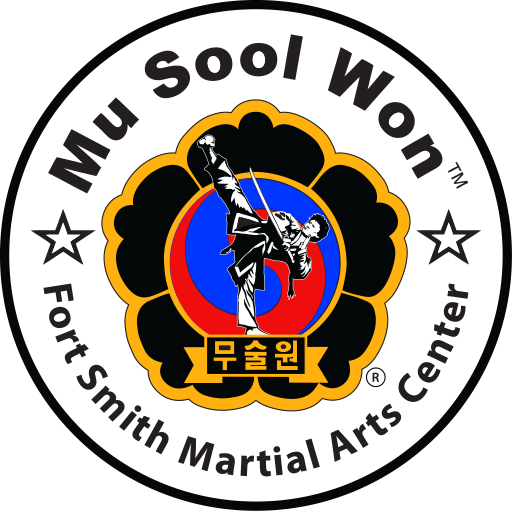 Mu Sool Won, a Korean phrase meaning ‘Military Art Academy’, is an organization which studies and teaches Korean traditional martial arts made up of Royal Court Martial Arts, Buddhist Martial Arts, and Tribal Martial Arts. Mu Sool refers to all types of martial arts skills to protect and train our body and mind in an organized and systematic way, through either empty-handed self defense or through using weapons including the sword, stick, spear, axe, dagger, gun defense or any of the 24 categories of weapons taught in Mu Sool Won. Through doing so, we do not limit ourselves to any particular martial art and learn to defend ourselves by any means necessary. A lotus flower grows out of stinky and polluted water but never compromises itself. Rather, it destroys and eliminates smells and odors, making its dirty and unfriendly environment clean and safe. Thus, the lotus flower in the logo is to represent a ‘lotus world’, peaceful and clean, which Mu Sool Won is trying to build for world peace. While its gold background is to represent the Mu Sool Won’s power and prosperity in the world, its five black petals represent the five virtues that each student should develop as he/she ascends to the rank of Black Belt found in the Hwa Rang Oh Kaye: Loyalty to your Teacher and School, Filial Piety towards parents, Trust and Brotherhood among friends, Courage in the face of the enemy, and Justice in combat. A Taeguk symbol is a circle with the pattern of the two competing, co-whirling ki (life force) energies called um (negative, colored blue) and yang (positive, colored red) that work together in all things in the universe. The Taeguk symbol in the logo, seated on the lotus flower, is to represent a perfect um-yang balance in our body, fulfilled through constant martial arts practice, which boosts our immune system and promotes the strength and sustainability of our body against illness and disease. Such a Taeguk pattern, found everywhere in several different forms including those engraved on prehistoric Korean dolmens, those painted on the walls of ancient Korean tombs, and those found on the buildings of Buddhist temples, is the pattern that can best describes the Korean martial arts. The martial artist performing a perfect high side-kick, with his left foot placed on the words Mu Sool Won, with his right foot stretched wide and high up into the air, with his empty left hand in a defensive position, with his right hand holding a sword parallel to the stretched right leg, and with his eyes staring into the ‘lotus world’, represents the mission of Mu Sool Won to educate students to their highest potential, who can contribute to the building of the peaceful and clean ‘lotus world’.